Thomas Dunne Books, 9781250009081, 261pp. 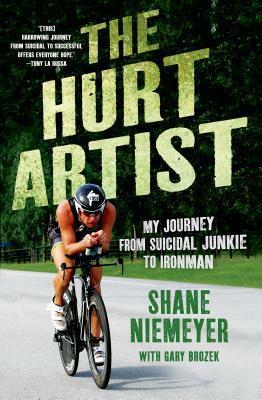 The Hurt Artist is the searing yet luminous travelogue of Shane's powerful journey from suicidal addict to Ironman. He vividly depicts the landscape of pain in which he's lived his life--emotional and physical pain inflicted upon him and that he inflicts upon himself, pain that pulls him down, and, in detailing his training, the pain he harnesses to lift himself up. Ultimately, Shane's story is one of redemption and triumph, a lesson in the value of second chances and a clear reminder that nobody, regardless of how seemingly desperate their circumstances, is beyond the reach of salvation. SHANE NIEMEYER developed and executed a plan to turn his life around and become a world class endurance athlete, speaker, and expert in the field of strength and conditioning. He currently resides in Boulder, Colorado where he coaches, trains, competes, and plays.GARY BROZEK has collaborated on more than twenty books, five of which have gone on to become New York Times bestsellers, including most recently Trident K9 Warriors. He lives in Evergreen, CO.